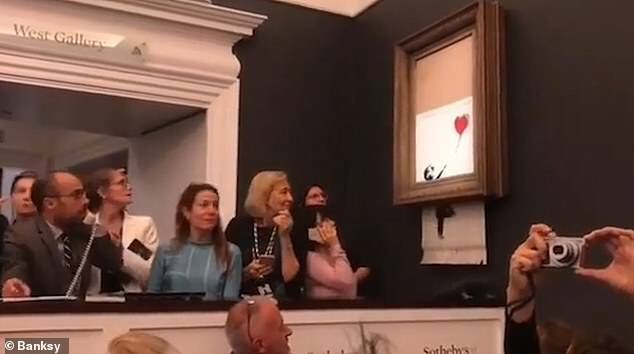 Banksy has dropped the strongest hint yet that he was behind the shredding of his iconic artwork Girl With Balloon after it self-destructed moments after the gavel fell for more than a million at Sotheby’s auction. The video captures the complete shock of everyone in the room as a shredder he secretly built into the frame whirred into life. A stunned member of auction staff can be seen on the phone to the winning bidder as the painting is destroyed in front of his eyes. 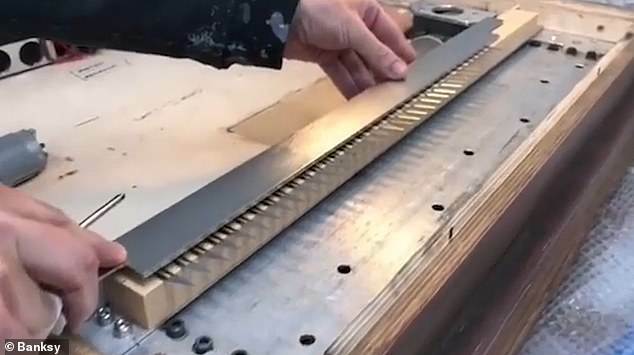 Banksy posted the clip on his Instagram. In it, he reveals video of himself building the shredder. However, he may have inadvertently helped to reveal his own identity because other people filming the scene caught him on camera. However, far from devaluing the art, experts believe that last night’s stunt may have actually doubled the price of the work because of the huge interest it generated. 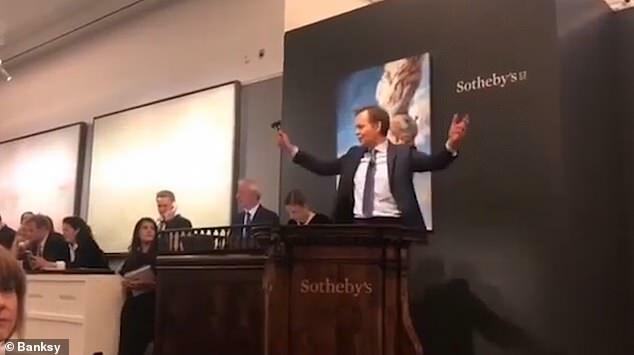 Immediately after the auction Alex Branczik, Sotheby’s senior director and head of contemporary art in Europe said: ‘It appears we just got Banksy-ed. But today Joey Syer, co-founder of MyArtBroker, said: ‘The auction result will only propel this further and given the media attention this stunt has received, the lucky buyer would see a great return on the £1.04million they paid last night. As the sale concluded to a phone buyer the canvas suddenly passed through a remotely activated shredder installed in the frame and an alarm went off. The artwork was photographed dangling in pieces from the bottom of the frame as auctioneers removed it from the wall. 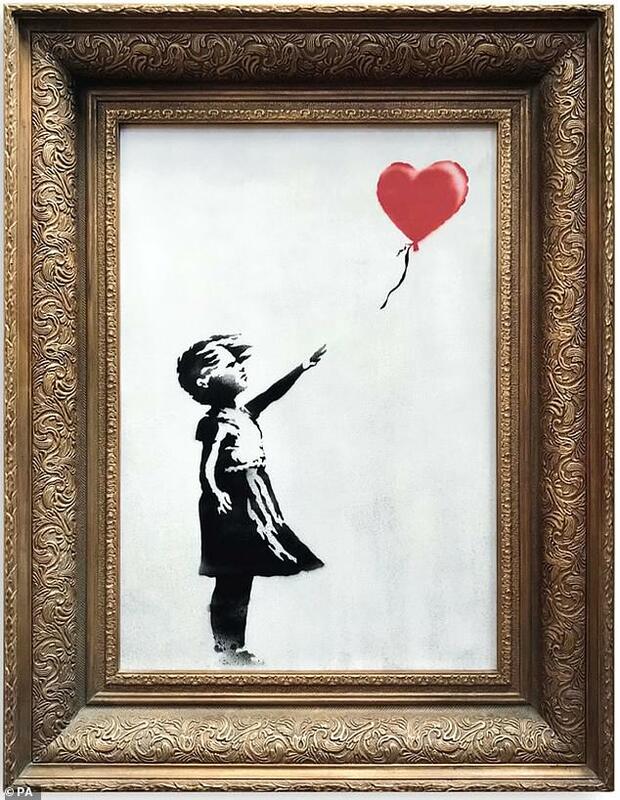 The Girl With Balloon, which was signed and acquired from Banksy by a mystery buyer in 2006, was the final piece auctioned in a contemporary art sale on Friday night. 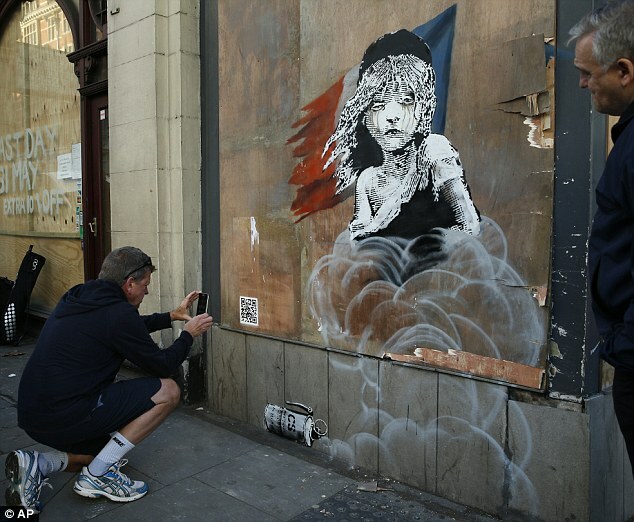 The framed stencil painting is one of Banksy’s most recognized murals, and the original appeared on a shop wall in east London, depicting a girl reaching towards a heart-shaped balloon. It is not known who the successful bidder is but Sotheby’s said they are talking to them and that they were ‘surprised’ by the bizarre stunt. 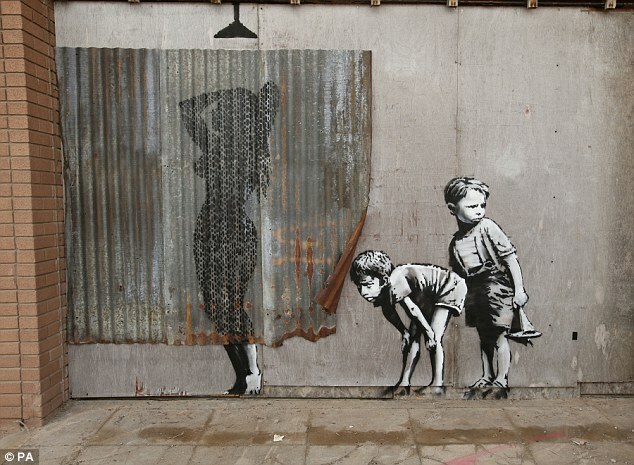 Alex Branczik, Sotheby’s senior director and head of contemporary art in Europe said: ‘It appears we just got Banksy-ed. ‘We have talked with the successful purchaser who was surprised by the story. 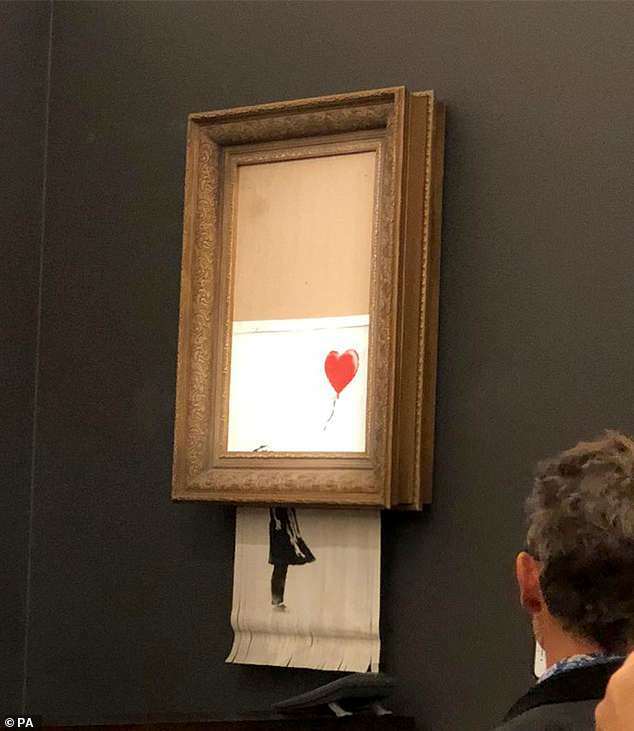 Sotheby’s described the work ahead of the sale as ‘authenticated by Pest Control’, the handling services organization that acts on Banksy’s behalf. It was signed and dedicated on the reverse and had been acquired by the vendor directly from the artist in 2006, the auction house said. However, there is speculation that the shredded art could be fake. It is not known who bought the work from Banksy in 2006 and whether or not they were in on the stunt. It would appear that Sotheby’s did not know about the stunt, though, nor the buyer who now simply owns shreds of paper. Whether or not he or she will still have to pay the huge price is also unclear. 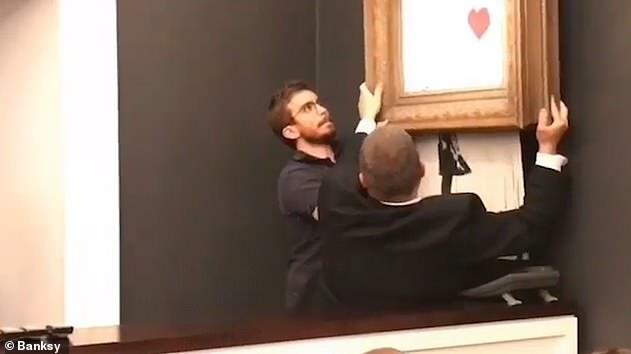 But some people on social media claim that Sotheby’s was actually involved in the prank. 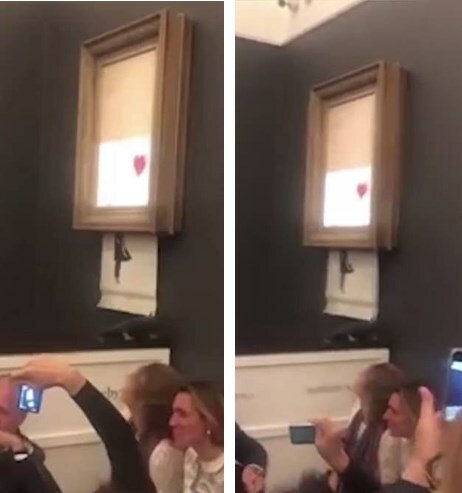 People online also thought that Banksy’s prank was a rebellious statement against the art world because his pieces are made to be ‘experienced’ and not owned. Celebrities were quick to pay tribute to the unusual prank on Twitter. Banksy is known for rebelling against the art world. 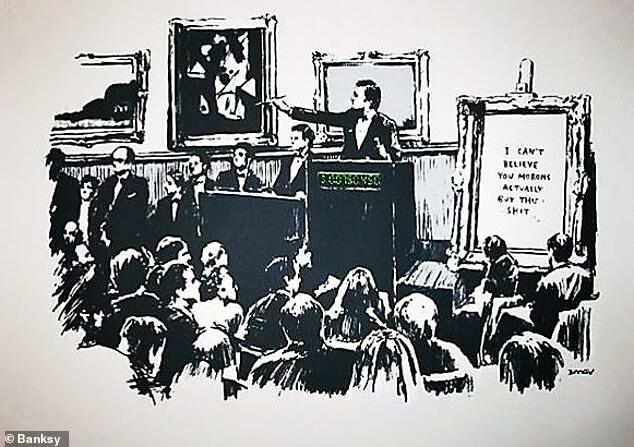 In 2007 Sotheby’s sold three of Banksy’s works. The day after the sale he updated his website with an image of an auction house and the people bidding on a picture with the written words ‘I Can’t Believe You, Morons, Actually Buy This S**t’. Banksy is a Bristol-born artist whose true identity – despite rampant speculation – has never been officially revealed. Other recent works included the opening of Dismaland, his dystopian, Disneyland-esque theme park in 2015, which he described as a ‘family theme park unsuitable for children’. Since Banksy made his name with his trademark stencil-style ‘guerrilla’ art in public spaces – on walls in London, Brighton, Bristol and even on the West Bank barrier separating Israelis and Palestinians – his works have sold for hundreds of thousands of pounds. He has dozens of celebrity collectors including Brad Pitt, Angelina Jolie, and Christina Aguilera. He is also known for his headline-making stunts, such as leaving an inflatable doll dressed as a Guantanamo prisoner in Disneyland, California, and hanging a version of the Mona Lisa – but with a smiley face – in the Louvre, Paris. But perhaps his most provocative statement and the one that generates the most publicity is the fact that Banksy’s true identity has always been a jealously guarded secret, known to only a handful of trusted friends. A network of myths has grown up around him including that his real name is Robin Banks or he used to be a butcher. There is also the rumor that his parents don’t know what he does, believing him to be an unusually successful painter and decorator. Then there’s the suggestion that Banksy is actually a collective of artists and doesn’t exist at all. 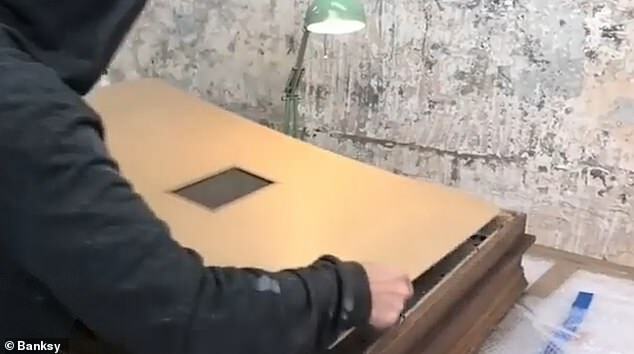 Such is the curiosity about Banksy that when he threw a pizza box into a bin in Los Angeles, the box resurfaced on auction site eBay, with the seller suggesting that the few anchovies left inside might yield traces of his DNA.